Kacey Musgraves is a blossoming country music artist whose recent album “Golden Hour” will compete with heavy-hitters at this year’s Grammy Awards for Album of the Year. She’s released only four albums (through major labels), so the nomination is remarkable. 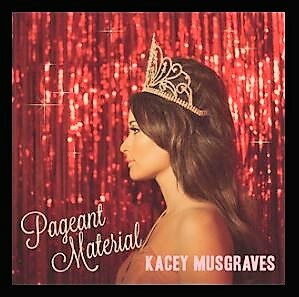 And yet – despite the acclaim heaped on “Golden Hour” – my favorite Kacey song remains a track from her second album, “Pageant Material”. In her words, it’s “a little, tiny, music-box-of-a-song” called “Cup of Tea”. Kacey wouldn’t mind if I told her “Cup of Tea” gets me thinking just as much about tea as about how well I mesh with other people. Not that I’ll be steeping anytime soon, mind you. I can’t seem to acquire tea-taste, no matter how many times I put the kettle on. Go figure – half my DNA originates from England, so you’d think my instincts would have me setting out the fine china and doilies every afternoon. I’d nibble on the cakes or scones or whatever comes with, but no tea, please. 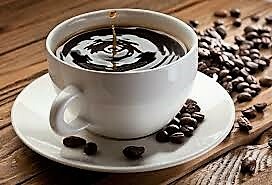 I much prefer my morning coffee. Ironically, tea brews with some of my earliest childhood memories. My parents used to take my brothers and I downtown in Los Angeles, to restaurants on the streets of Chinatown – probably as much for the cultural experience as for the food. I can still picture those dark, quiet dining rooms, with the strange music and gaudy decor. The meal always began with a pot of tea, including the little round cups that seemed to have misplaced their handles. Tea was a cool experience back then. Listen, when all you drank was milk or water (or the occasional soda), tea was pretty sweet no matter how it tasted. It was like having a “grown-up” drink before being grown up. Forty-odd years later, I notched another tea-riffic memory. My wife and I took a cruise on the Baltic Sea a few summers ago (“six countries in eight days”), and chose Oceania, one of the nicer cruise lines. Good decision. As much as we enjoyed the excursions off the ship, we enjoyed the return even more, because every day we were treated to “afternoon tea”. Oceania’s tea was the perfect respite between the early morning touring and the evening dinners/dancing. 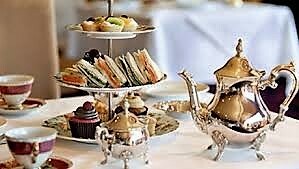 “Tea” included tableside service from tuxedoed waitstaff, countless cakes and petit fours, and those little triangle sandwiches with the crusts removed. “Tea” even included a string quartet; their soft music adding to the ambiance. I suppose I could’ve asked for coffee instead, but that would’ve tainted the experience. Not to say I enjoyed the tea itself. Just “afternoon tea”. The culture, history, and preparations of tea could generate a week’s worth of posts. (See the Wikipedia article here). 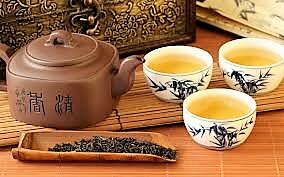 What I find more interesting is how tea has become the daily routine of several global cultures. 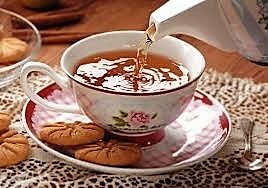 The Chinese and Japanese consume tea in the morning “to heighten calm alertness”. The Brits serve tea to guests upon arrival (or in the mid-afternoon), for “enjoyment in a refined setting”. The Russians consider a social gathering “incomplete” without tea. Not sure about all that, but I can at least agree with the moment of pause tea provides; the respite from the faster pace. It’s just… my “cup of tea” is coffee. This entry was posted in culture, food, memories, travel and tagged Britain, China, coffee, cruise, England, Japan, Kacey Musgraves, respite, tea, UK, United Kingdom. Bookmark the permalink. Enjoyed the “ending.” I get in moods for tea, that’s all they drink in Ireland.